Is it time to inject some excitement into your life? A visit to Chitwan National Park to see single horned Rhino’s, Elephants and the elusive Bengal Tiger. 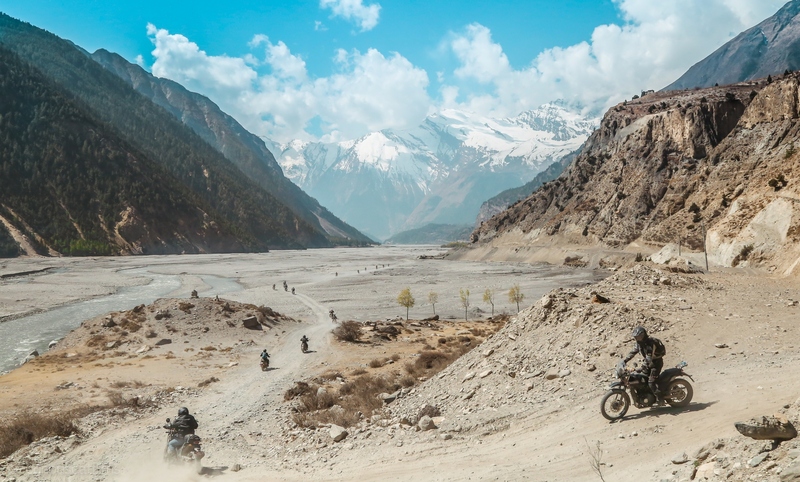 As we head north into Pokhara, which is the base for the trekkers on the Annapurna Circuit, the roads give a hint of what the Mustang Valley has in store for the next 4 days. They will test you and the bikes to the limit. 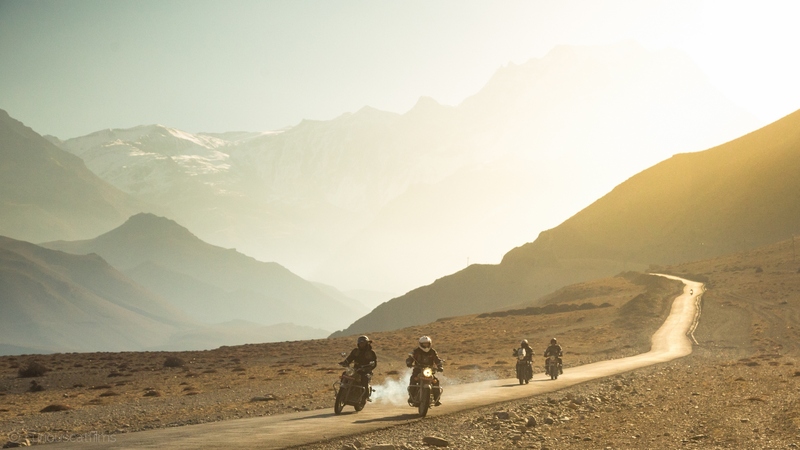 The view once you are in Muktinath is undoubtedly worth it. Climb the “Stairway to Heaven” up to the town monastery and take in the majesty of the Himalayas. Descending into the valley back into Pokhara for a free day, you can do your laundry, go parasailing, chill on boat on the lake or have a few celebratory drinks. 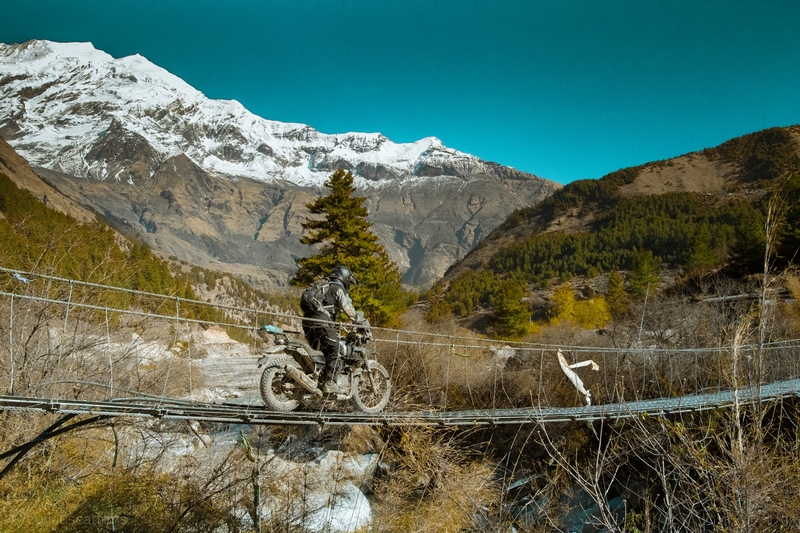 Or…..we good go in search of suspension bridges to cross! 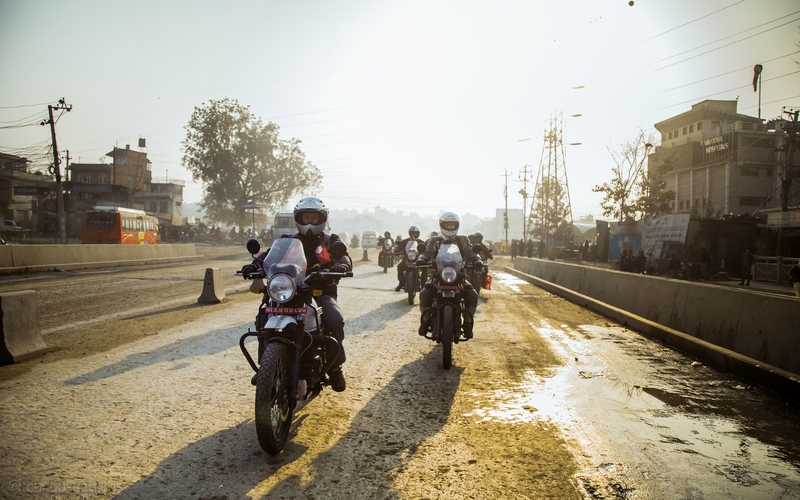 We then scoot across back to Kathmandu taking the long way home alongside a river into an area that got hit hard by the 2015 earthquake. 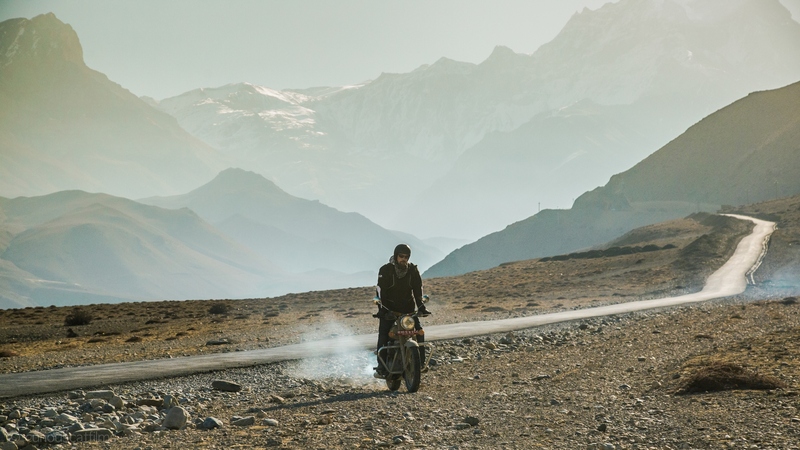 An air of melancholy inevitably surrounds you as you realise your adventure is nearing its end, …until you realise you can come back again and do one of our other adventures! 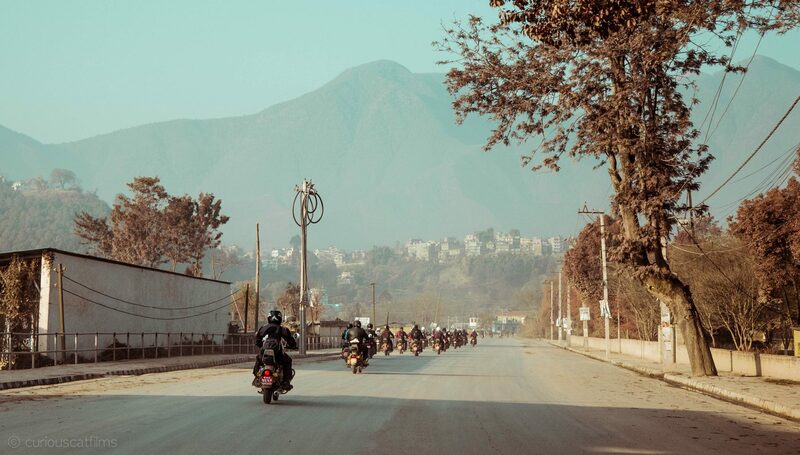 As you descend from the clouds over the majestic Himalayas, you will see the bustling city of Kathmandu where we will start and finish our adventure. 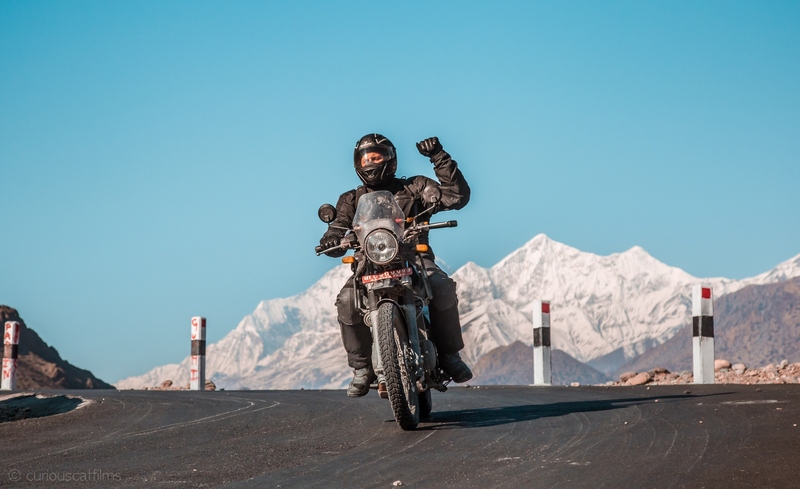 A Himalayan Heroes representative will be waiting for you as you exit the airport. They’ll accompany you to your hotel not far from the tourist haven of Thamel. 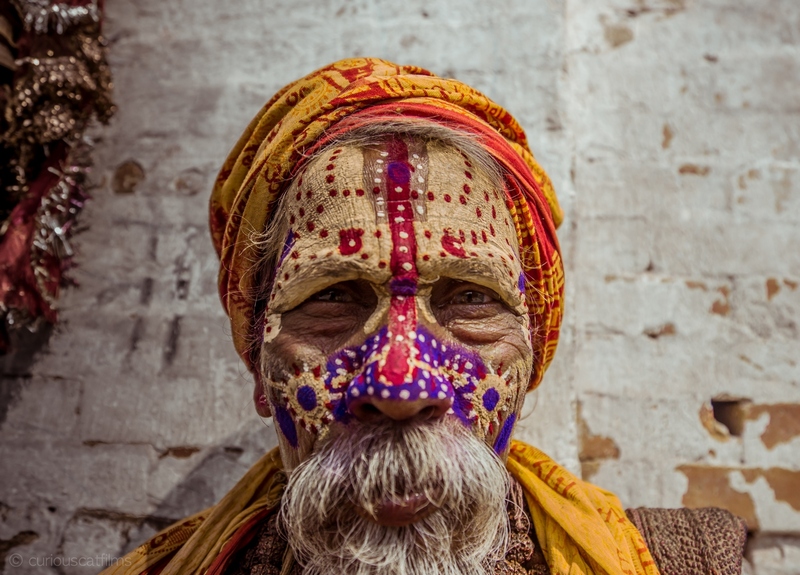 After lunch, we’ll visit Pashupatinath Temple where you’ll see corpses cremated in a traditional Hindu ceremony on the banks of the Bagmati River. 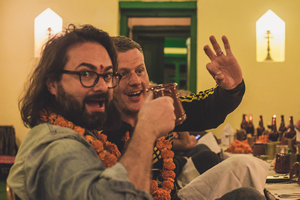 Later in the evening we will have a welcome dinner at an authentic Nepali restaurant to get to know one another, have the first of many culinary masterpieces and be entertained with a cultural show. Today is the day the adventure starts proper. The traffic in Kathmandu is similar to that in a lot of developing countries so we try to avoid it best we can by getting an early start. A quick breakfast while the support team load the back-up vehicles with your luggage before a refresh of the rider briefing and getting the keys to your motorcycles. Keep your wits about you as we head towards the mountains that surround the village of Daman which will be our destination for the evening. Daman has among the greatest views of the Himalayas, extending on a good day from Dhaulagiri in the west to Mount Everest in the east. 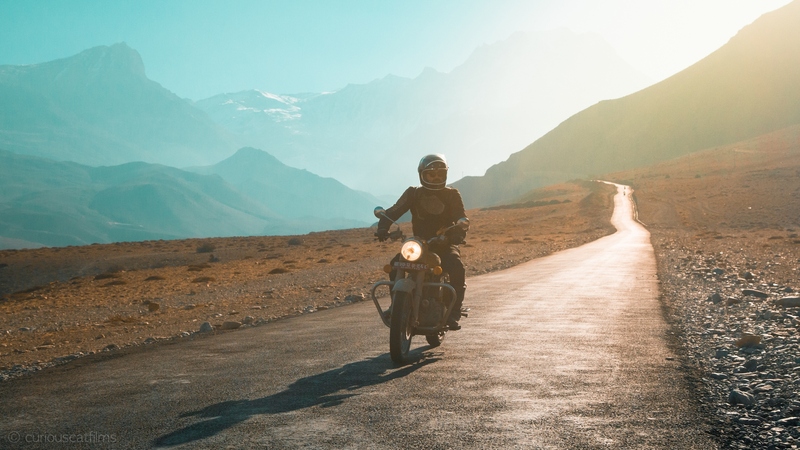 The serpent like roads around Daman will probably provide the best sealed road riding of the whole adventure so make sure you get into the groove early. We encourage people to rise early to see a once in a lifetime sunrise before breakfast. The views are stunning immediately after breakfast as we climb a little higher before descending to Hetauda. We follow the East Rapti River west towards Chitwan National Park and check in to our hotel and have lunch. There will be some free time in the afternoon if you wish to embark on a safari through the jungle to catch a glimpse of the local wildlife such as single horned Rhino’s, Bengal Tigers, Mongoose, Striped Hyenas and many more wild animals before watching the sunset in the early evening. We head north towards Narayangarh which is an important trading centre of central Nepal and is famous for “Taas”, a spicy fried goat-meat lunch dish served with Bhuja or Cheura (Beaten Rice). At the outskirts of Pokhara, we are greeted with views of the Annapurna Mountain range including the famous Fish Tail Mountain. Pokhara is the tourist centre of Nepal with its crystal clear lakes and fantastic views of three of the highest mountains in the world. It provides the perfect base for trekkers who want to tackle Annapurna Circuit. We don’t have time for that but there is plenty to do when we come back in 5 days’ time and have a free day. 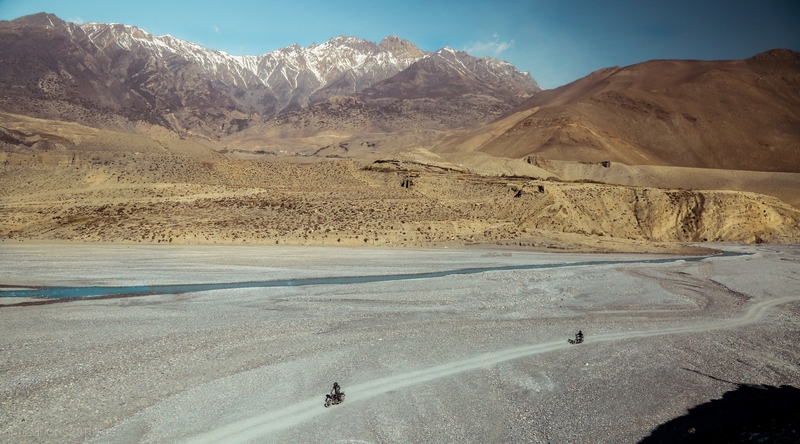 As the roads become challenging, rough and unsealed with many river crossings for the next 4 days, we ask people to pack lightly, taking only what is necessary until we return. 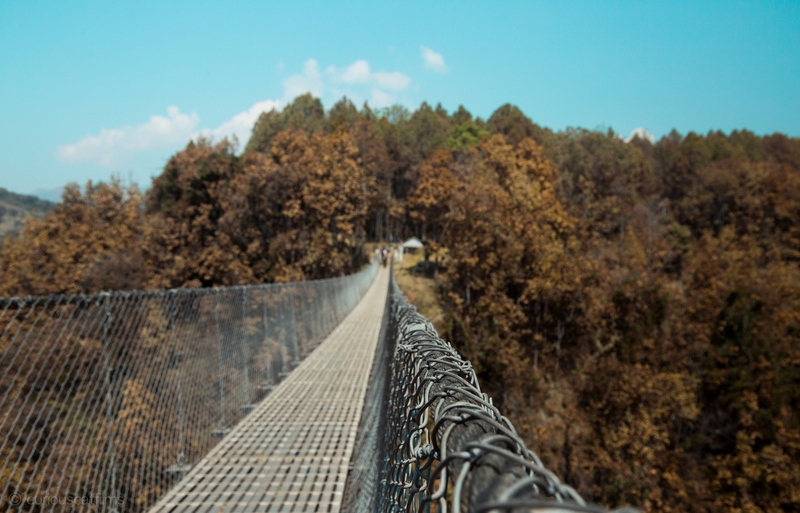 Starting out on tarmac, we’ll end up on some great off road routes that provide fantastic mountain vistas, picturesque terraced farmlands and an opportunity to walk on one of Nepal’s famous suspension bridges. There is a continuous change in the topography with every twist and turn until our arrival at Kalopani. 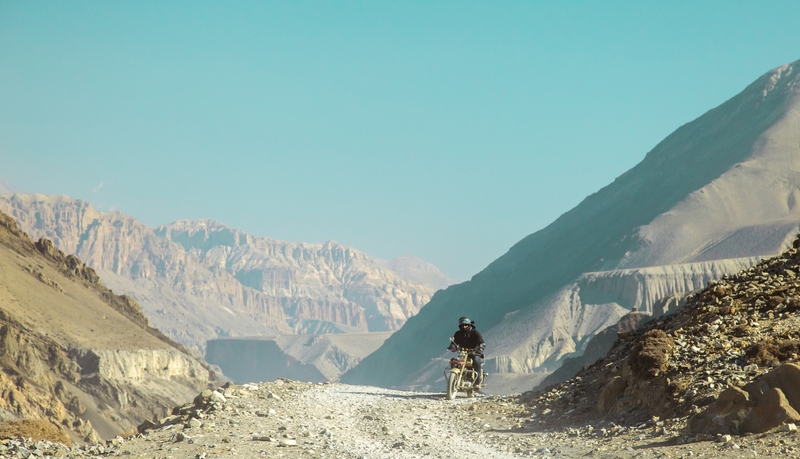 A short ride through some of the most amazing landscapes of the adventure will see us tackle a large river crossing in Lower Mustang. 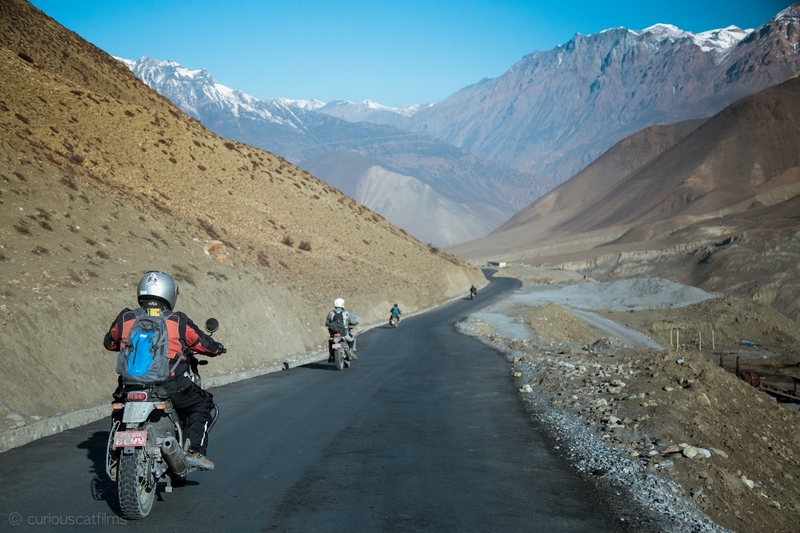 The road to our hotel is spectacular as we travel through a number of remote villages. 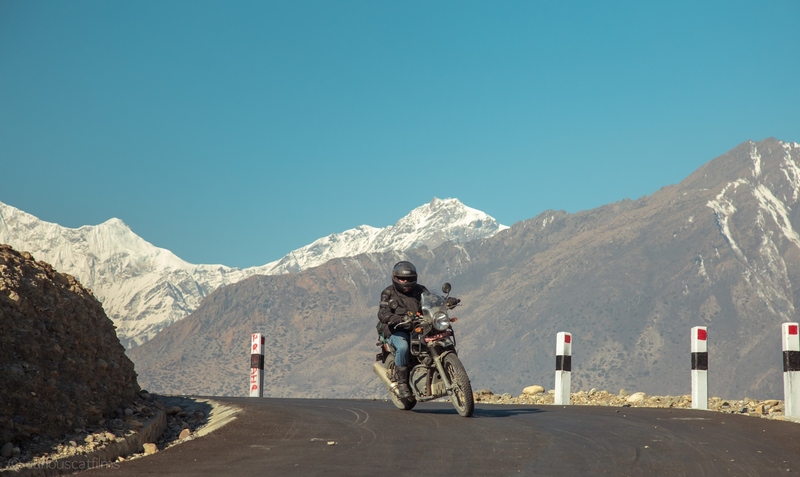 Muktinath is the highest elevation we reach and while you might be short of breath walking around the village exploring, it is unlikely you will suffer from altitude sickness. 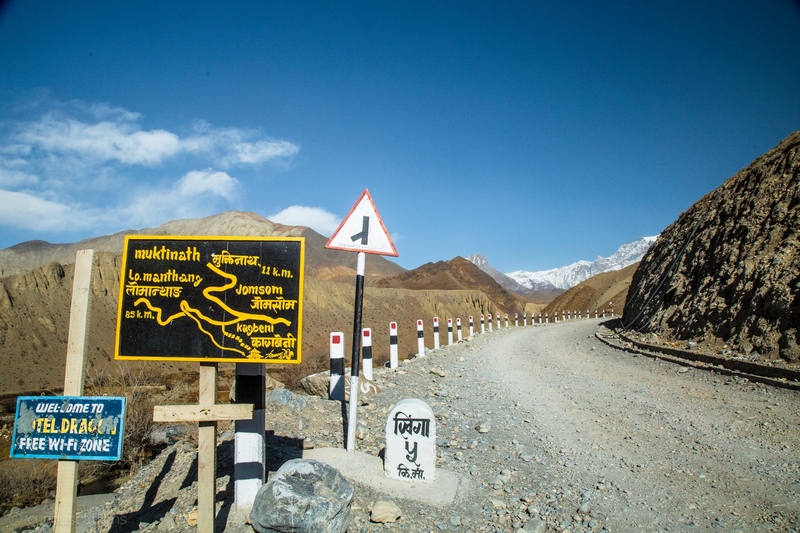 Muktinath is part of the Annapurna Circuit, and you’ll encounter many trekkers from across the globe here. Heading back down, we’ll stop in Kagbeni for a short visit to the local monastery where many Yogi’s come to isolate themselves in the caves overlooking the village to practice their meditation and rituals. We’ll then continue on to Tatopani to soak in the hot springs. “Tato” meaning ‘hot’ and “Pani” meaning ‘water’, it’s obvious to see how this town was named. Although you have ridden this road a couple of days earlier, you’re going to see the gorges from a totally different perspective. It’ll give you a chance to really soak up what you might have missed the first time or to stop and take that Pulitzer prize winning photo. 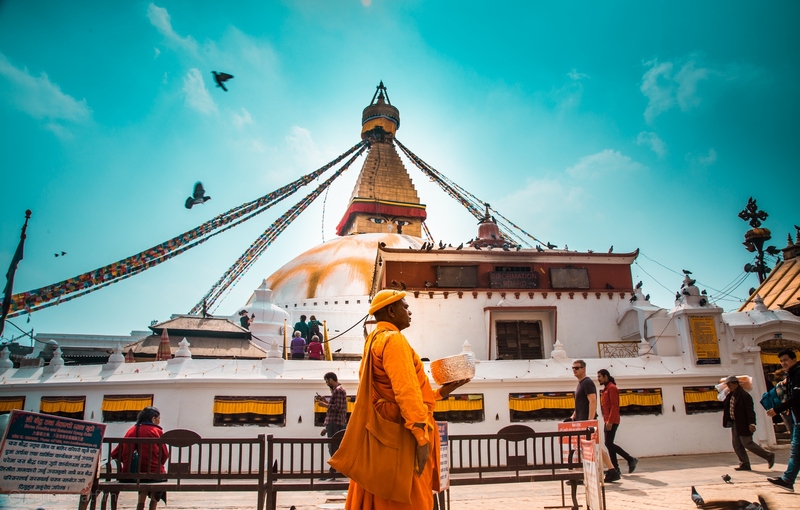 Today is a day of leisure, spend it recovering from the night before or visit the local shops, take a canoe ride on the nearby the Phewa lake or catch a cable car to the World Peace Pagoda or even visit one of the five museums and if you’re feeling adventurous then you could go parasailing. 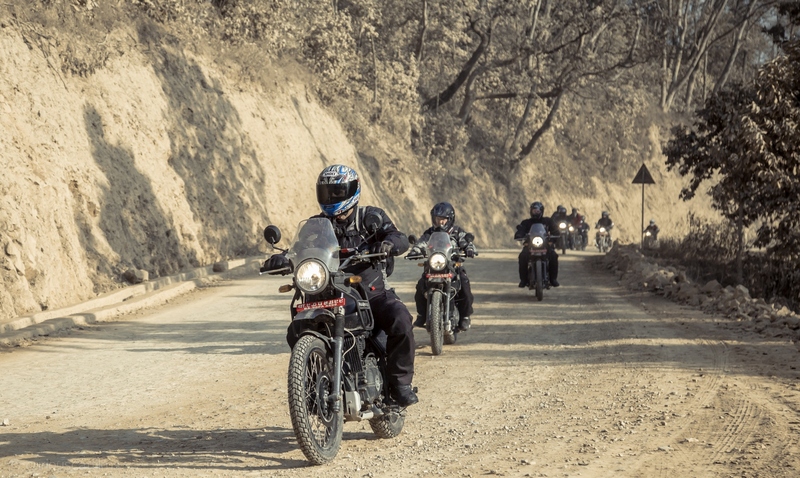 We head east alongside the Trishuli River as it detours from the highway all the way to Nuwakot. This is rural Nepal that not many people see. Reminiscent of the rice paddies of Vietnam and Thailand, the farming land between you and the river is busy with people working hard to make a living. You’ll have the chance to visit the Nuwakot Palace once we arrive at our very special accommodation. 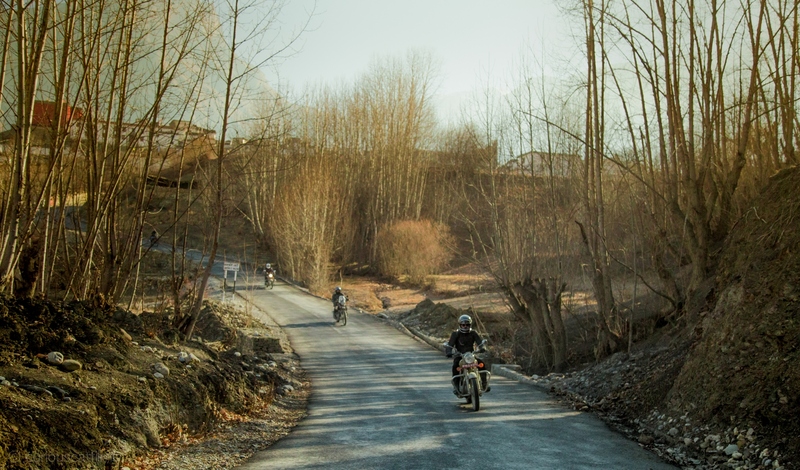 We ride through some small villages, returning the vigorous waves directed at us while trying to soak in the stunning views that the terraced farm land present. 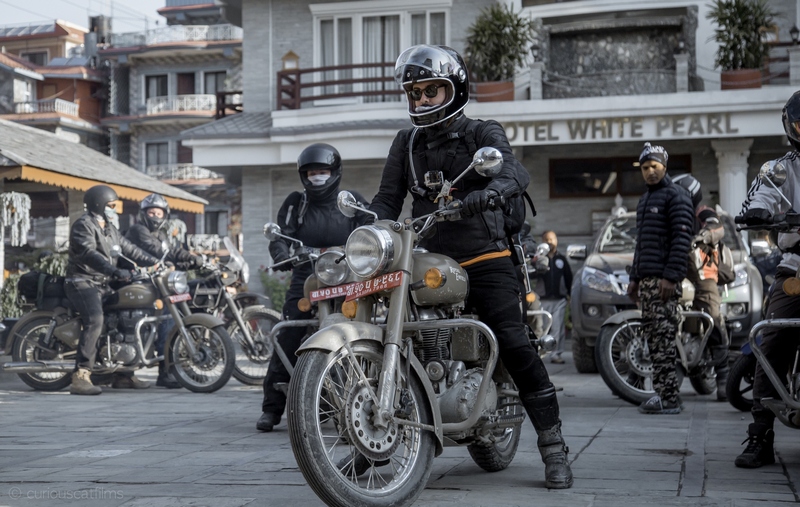 After stopping for a chai break, we emerge from the forest and descend upon the mayhem of Kathmandu. 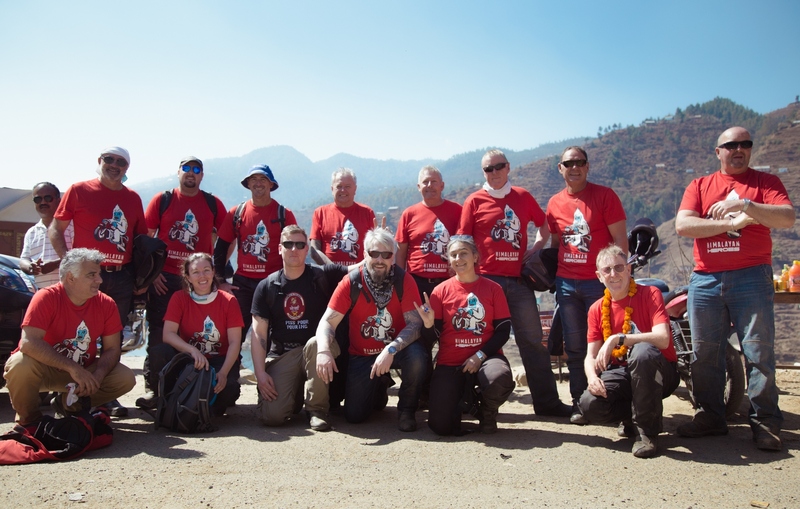 Upon arrival at the hotel we’ll have time to hit the town and celebrate our fantastic achievement with a dinner at a local Nepalese restaurant with great food and atmosphere. For those that would like to arrange their own trek, this site has some great information. 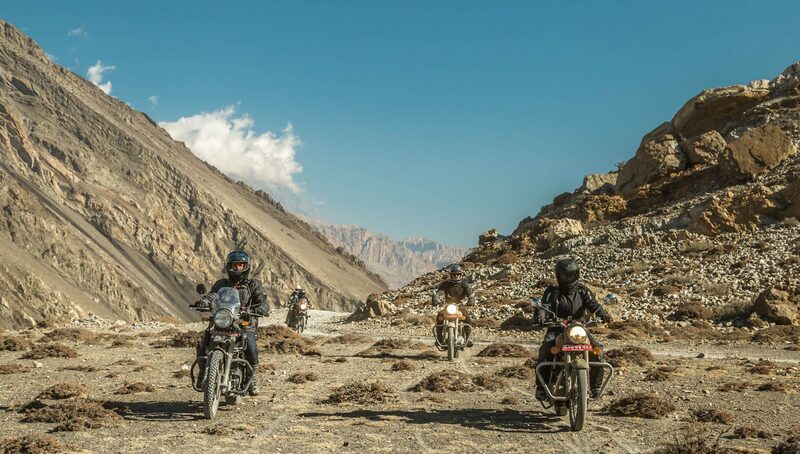 The trek below is popular with our riders as a 5 day extension before or after their motorcycle adventure. We’re happy to arrange and customise it for your needs. Flight to the World’s Scariest Airport and 5 Day return Trek to the gateway of Mt Everest Base Camp. The tallest point on Earth, Mt Everest (8848m) is so close yet so far, why not take a few extra days and fly to the world’s scariest airport described as “a strip of licorice in a wall of granite”. The primary goal of this trek is to see Mt Everest (8848m) and the villages of the world famous mountaineers, the Sherpas. The view of Mt Everest, from above Namche Bazaar is truly stunning. We walk past a small airport towards the Everest view hotel. Here we’ll enjoy a coffee and the breathtaking scenery of Mt Nuptse (7879m), Mt Lhotse (8416m), Mt Lhotse Shar (8400m) and Mt AmaDablam (6812m) along with of course Mt Everest. Transfer to and from the Hotel / Domestic Airport / Hotel (Pre & Post Trek) in a private vehicle accompanied by Trek guide. 4 Nights / 5 Days trek in the Everest / Khumbu region inclusive of all meals (breakfast + Lunch + Dinner), accommodation in available local lodges or tea houses and the services of an experienced – Trek guide, Sherpas and the strong & reliable porters. Sagarmatha National Park entrance fees of US$30 per person. Trekker’s Information Management System (TIMS) card fee of US$10 per person. 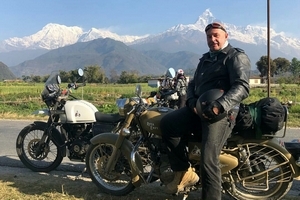 All expenses for the guide, his daily allowances including his meals and flight from Kathmandu / Lukla / Kathmandu. After breakfast, we get transferred to the domestic terminal of Kathmandu airport for an early morning flight to Lukla (2880m). This 45 minute flight provides a magnificent entry to the trek as it highlights the snowline of the Himalayan Range in the north and the rugged landing at the Lukla airport which is said to be one of the most spectacular flights in the world. Upon arrival, we meet the Sherpa team who’ll distribute the equipment to the Porters and Dzhopke (a cross between and cow and a Yak used to carry loads). During this break, you are welcome to explore this bustling town on top of a hill with rows of houses, hotels and shops lining both sides of narrow cobbled streets. The trek starts by following the trail leading to the northwest direction, which immediately descends from the end of the village on a trail through the open hillside. 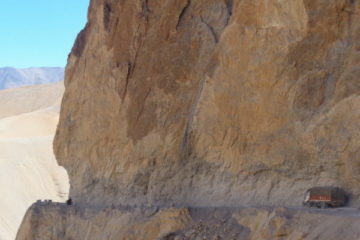 The trail is well defined and there are many shops and lodges catering to the trekkers. We cross a recently constructed suspension bridge (100 meters long) at the very beginning of the journey. From there we follow the regular trail passing small villages of Chaurikharka (2713m) and Ghat (2550m), with shops and restaurants on the way until we descend to the river at Phakding (2652 m). 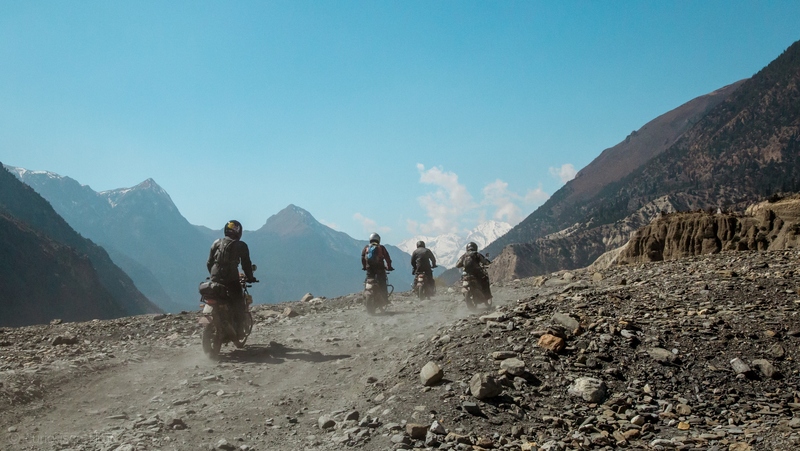 Leave the main village and the follow the trail on the left bank of the Dudh Koshi River. It is a pleasant walk for the first half of the day as one passes through agricultural countryside, small wayside villages and a monastery. We cross the Dudh Koshi at Benkar where there are tantalizing glimpses of the snow peaks Kusum Khangaru (6369m) and Thamserku (6623m). Just before lunch, there is a steep climb of about 20 minutes to arrive at Monjo for Lunch. After lunch, we trek up to the check post to check the permits and enter into the Sagarmatha National Park. Descend for 10 minutes and then cross a suspension bridge to arrive at Jorsale (2800m). We then pass through several small villages surrounded by beautiful pine forests. This is a busy trail with our first good views are of the west ridge of Kusum Khangaru (6339m). 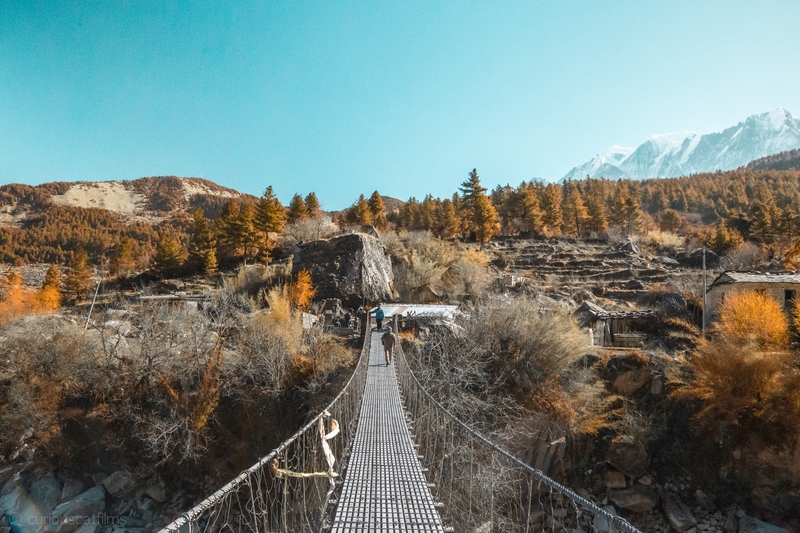 Follow the Dudh Koshi River, crossing a rickety suspension bridge, which is in a dilapidated condition, and then slowly climb up a very steep trail to Namche Bazaar. Near half waypoint, we enjoy our first views of Mt. Everest (8848m), Nuptse (7879m) and Lhotse (8383m) – the big three. The climb takes nearly 3 hours as the altitude makes breathing a little difficult. 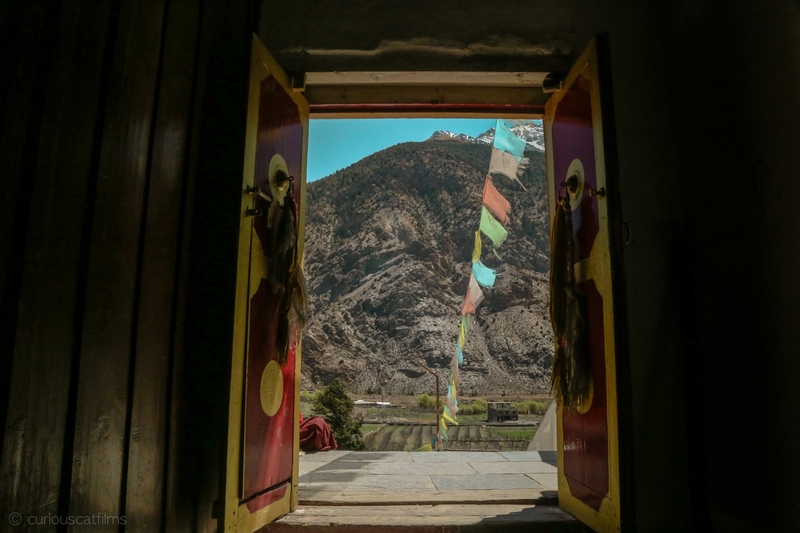 Although we arrive at a gate with a sign saying, “Welcome to Namche Bazaar” it is a tad misleading as it takes another 20 minutes to arrive at the main town. Upon arrival at Namche Bazaar (3447 m) we check into the lodge. 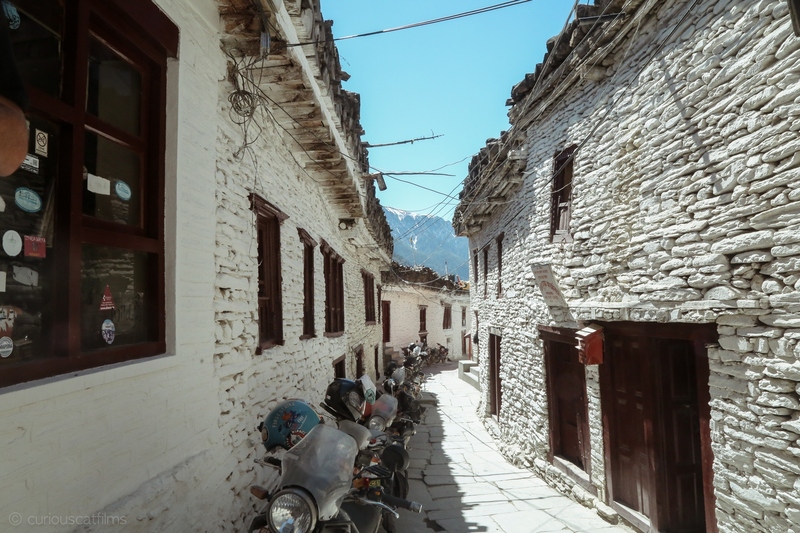 This prosperous town is the largest in Khumbu. Mt. Thamserku (6648 m) and Kwangde Ri (6624 m) loom above the east and west of the village. The sacred mountain Khumbila (5707 m) dominates the skyline along the west. Explore around the Everest View Hotel to see Mount Everest and a day trek to Khumjung Sherpa. After breakfast we trek to Lukla. From Namche Bazaar head towards the southern end of the bazaar and descend steeply all the way to the confluence of Dhud Koshi and Bhote Koshi river, cross the great bridge again, and then continue back to Jorsale where we leave the national park before continuing on to Monjo. From here we pass the village of Monjo and It is interesting to watch others starting enthusiastically on the trek ahead as we head down to the village of Phakding. 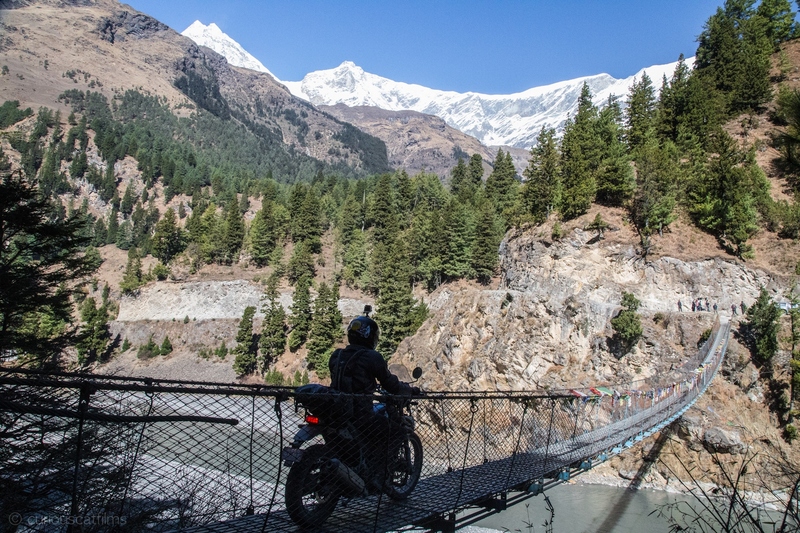 Today we re-trace our steps along the Dudh Koshi, crossing to the western bank at Benkar. It is a beautiful and easy walk through blue pine and rhododendron forest, back-dropped with views of Kusum-Khangaru (6179 m). 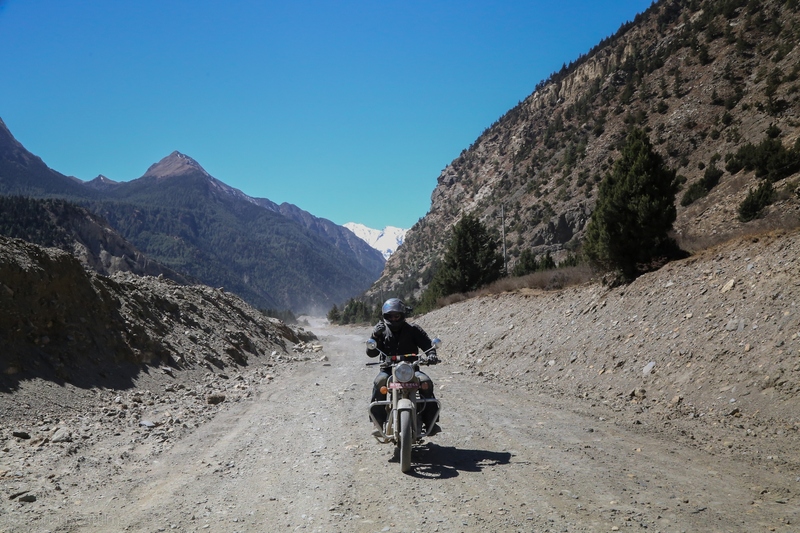 In the afternoon we ascend out of the river valley back to the airstrip and our lodge accommodation at Lukla. We’ll stay overnight in surely what is one of the most surreal villages on the planet. 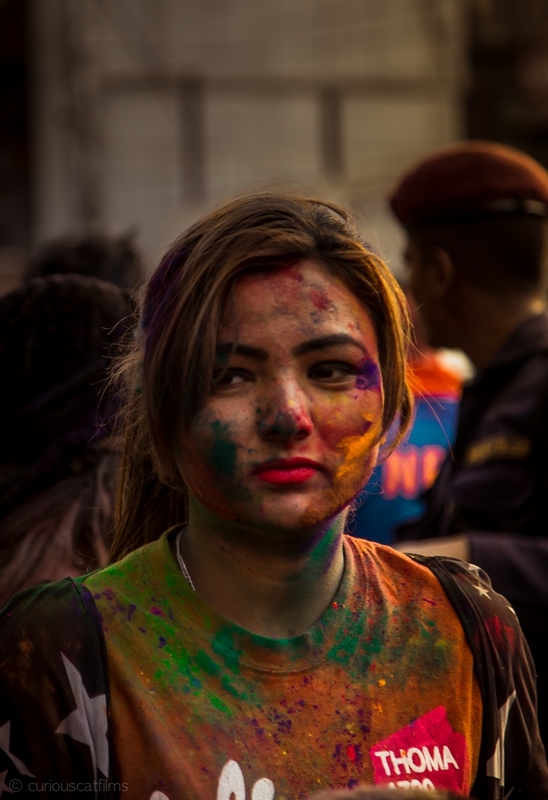 Two weeks in Nepal is nearly at an end and the celebrations with our Sherpa companions will be epic. We’ll catch an early morning flight back to Kathmandu for some last minute shopping etc before being transferred to the airport for your trip home.